Siemens have been the market leader in substation automation for many years now, and will continue to hold this position as they keep developing inventive ways for the automation process to be simpler and more efficient. Siemens achieved their goal to be the first relay manufacturer to implement IEC 61850 successfully across their product range. Now with many years of experience and knowledge gained from working with IEC 61580 at literally hundreds of sites around the world, Siemens provide the most flexible products and support for implementing IEC 61850 seamlessly into projects. DIGSI is a Siemens setting program, to configure SIPROTEC Devices. It provides an easy-to-use interface for commissioning, controlling and testing IED's. IEC 61850 has become established as the communication backbone for the new era of energy automation and control. Siemens is considered the leading expert in IEC 61850, being the first manufacturer to offer protection relays and substation control systems with IEC 61850 compliant communications protocols. Not only do SIPROTEC and SICAM PAS systems support IEC 61850, but Siemens also offer a number of productivity tools. Designed by practical people who have experience in the industry, SIGRA is a complete fault record analysis tool. In addition to time-signal display of the measured variables recorded, it can also display vector diagrams, circle diagrams, and bar charts for indicating harmonics. From the measured values which have been recorded in the fault records, SIGRA 4 calculates further values, such as absent quantities in the three-wire system, impedances, outputs, and symmetrical components, etc. SICAM Diamond is a web-based operating and monitoring system providing user-configured HMI. It uses modern client/server architecture to provide a low cost, user friendly, operation and diagnostic solution for industrial and network operations. PAS (Power Automation System) is a modular system for substation control. The SICAM hardware/software system can connect to SIPROTEC and other vendors' IED's, using a wide range of serial and Ethernet protocols. Customised HMI's can be developed. This is the ideal product to support IEC 61850 and/or DNP protocols. The SICAM A8000 is a highly versatile building block, filling many applications within the Power industry. The device can be used as a small station RTU, a protocol converter, or programmed with logic and used as an automation controller. Using a standardised IEC 61131-3 graphical editor, a comprehensive library of logic functions are available, allowing you to quickly develop logic for switching/automation and control applications. The -40 to +70 degree C temperature range make this product ideal for field automation applications. The A8000 uses the well known PLC industry ‘SICAM Toolbox’ for the programming. Setup of the unit can be made by swapping out the SD card (offline parameterisation), or via direct Ethernet or remote serial engineering access. The A8000 also features a built-in web browser to allow local review/setup – simplifying and lowering the cost of maintenance!. 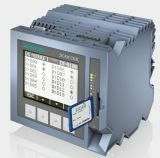 The SICAM I/O unit is ideal for substation automation applications. The one unit features a 24-220 Vdc operating range, allowing it to be used on 24, 48, 110 and 220 V systems! This I/O unit features 6 binary inputs (with selectable 19, 88 or 176 Vdc threshold) and 6 binary outputs (rated 250 V 5 A ac/dc). GOOSE messaging is now supported for Binary I/O expansion applications (in addition to MODBUS TCP). This allows GOOSE messages from an IED to be output to a 7XV5673 to operate relay contacts, or binary inputs to the 7XV5673 to be sent as GOOSE messages to the IED and/or other devices. Thus the 7XV5673 can be used as remote (or local) I/O expansion for IED’s with an IEC 61850 interface.